What began as a collection of tombstones in the front yard of 313 Clinton Avenue in 1994, evolved into a free live show for all ages that ran continuous performances throughout Halloween evening. 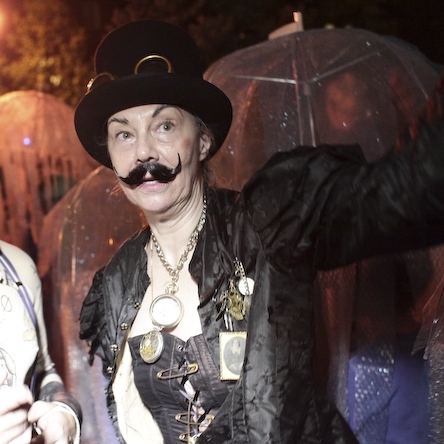 Over time, the elaborate show drew an attendance of more than 5,000 neighbors, visitors, and trick-or-treaters (the show coincided with the Society for Clinton Hill’s Annual Halloween Walk), and was made possible by the collaborative efforts of a dedicated and talented group of volunteers. Halloween 313 Theatrical was a self-funded, not-for-profit community group that depended on individual or group donations, as well as its partnership with the Society for Clinton Hill, for all operating costs. It also depended on the support and encouragement of friends, neighbors, strangers...the community, who came out year after year to stand on the sidewalk and cheer us on. Though it would be impossible to name everyone who contributed to the success of Halloween 313, the following is a list of some of the crazy folks who signed up every year to bring this unique Halloween experience to life. is an artist and accessories designer by trade and the fearless, obsessive ringleader behind Halloween 313. In addition to coordinating the yearly Halloween show, Janna works tirelessly painting backdrops and banners, and designing and building most of the costumes seen in the show. (See the Gallery for samples of her fabulous work!) Janna’s inventive costumes have also won “best in show” awards at the Coney Island Mermaid Parade on five separate occasions, including the “Judges Choice” for 16 costumes in 2007. In 2003, she was published in Country Living’s “Halloween Happenings.” She is also the proprietor of the Chat Noir parlor sales. A transplant from Florida, Janna has been a Clinton Hill resident since 1986.
is a long-time neighbor of Clinton Hill. She was the first real Halloween Lady who began the Society for Clinton Hill’s Children’s Halloween Walk in 1994. Roslyn single handedly plans the walk, and prints the flyers and maps to the homes that pass out candy the night of the event. She buys the candy herself and distributes thousands of pieces to each home so they don’t bear the cost burden on their own. She is also a member of the Society for Clinton Hill and we owe her a great debt of gratitude for her devotion to the cause! has served his Horror High Priestess, Janna, since the very first year of Halloween 313, in 1994. In all those many years since he has helped build skeletons, carve gargoyles, create tombstones, erect pirate ships, fire cannons, lug coffins, break into houses, hang effigies in second floor windows, splatter paint onto canvas, squirt blood onto costumes, and wear dresses, wigs, and puppet heads onstage! Andrew has also written many of the shows for Halloween 313, and has composed original music along with his band, the Gaslight Bastards. By day, Andrew is an illustrator, graphic designer, voiceover artist, and writer, having completed a novel that will be published next year, if he can get an agent to return his calls. is an American director of theater, opera and film. Her work has received many accolades from critics for her films Frida, Titus, and Across the Universe. She has earned two Tony Awards for her direction and costumes for Broadway's long-running The Lion King, in addition to a Drama Desk Award, an Emmy Award and an Oscar nomination for Best Original Song. is a production designer by trade, and designs the sets for Halloween 313. Cast as Renfield for the Vampire Opera, Matt discovered his inner ham and now is a regular scene stealer onstage! His best known roles are Officer Henry in Nightmare on Clinton Avenue, Captain Ahab in 20,000 Screams Under the Sea, and the little girl in the bed for A Grimm Scarytale. Being in the big bed with his own bottle made Matt very happy! But his finest, most celebrated performance was as the petulant Dolly in Malice in Underland, a role that he embraced with his usual unflagging enthusiasm...as well as tons of makeup! has been building the tombstones since the beginning of Halloween 313. But that’s just the construction. The epitaphs that go on the tombstones are created during a group brainstorm, usually with Marc, Janna, Claudia, Andrew, and whomever else happens to be in the room eating Doritos. From the bashing of politicians and celebrities who deserve it, to heart-felt salutes, to beloved figures who’ve passed on, no one escapes this death panel. Sometimes we’d like to see them dead, sometimes we’re sad they’re gone. Marc is a visual artist, an actor and percussionist, and has lived in Ft. Greene since the mid-80s. He’s the drummer for Gaslight Bastards, and once played “Hail to the Chief” for then-President Gerald Ford. Well almost, but he does still enjoy scaring kids of all ages. Our very own Halloween 313 love story, John married the lovely Holly Bedwell after they played the Frog and The Princess during A Grimm Scarytale and are now the proud parents of a future Halloweenie, the adorable Harper! is an animator by trade, and has been involved with Halloween 313 for several dedicated years now. Deanna is a hands-on artist who embraces every project we throw at her with skill and enthusiasm—from props, to painting, and sewing. For 20,000 Screams Under the Sea, Deanna made eight gorgeous fish heads out of cereal boxes and bike helmets. In 2014 she surprised us again with her role as an Inmate in Nightmare on Clinton Avenue. In 2015 she played Alice in Malice in Underland. Always anxious to learn something new, Deanna is a valuable member of Halloween 313! had his first encounter with the Halloween 313 crew by dropping by unannounced and uninvited in the year 1809, when there was a giant Jack Skellington perched over the entranceway to the Asylum. He didn’t actually join the crew until 2009, when he started doing artwork for the Halloween 313 t-shirts. Except for the couple of years when he was imprisoned by tentacled rats in the NYC sewer system, Deek has provided killer t-shirt designs and contributes silly ideas when it comes time to discuss each new show. You can check out more of Deek’s deviant work HERE. a.k.a., Chloe Dart (a stage name to die for! ), is a professional actor, director, and teacher, who has brought some memorable characters to life on the Halloween 313 stage. She was Temperance in Carnival of Carnage, the Queen of the Gypsies in the Vampire Opera, the diabolical Gretel in A Grimm Scarytale, and the villainous villainess, Anesthesia Hangbody, in Nightmare on Clinton Avenue. The only time Carole missed a Halloween 313 show was during ApoCALYPSO, when she was stranded in New Jersey due to Hurricane Sandy. No excuses this year, Carole! Master wood craftsman, painter, and builder of alien spaceships, big eyeballs, and pirate ships, Larry is our go-to for designing, building, and otherwise conquering feats of magic on 313’s front lawn. Larry has enthusiastically created the most talked-about prop to land in Brooklyn since Halley’s Comet: a full-size spaceship for Halloween 313’s 2007 show, Halloween Attacks: Intergalactic Sanitation Department. Larry also provides some tasty licks as lead guitarist for the Gaslight Bastards. Restaurateur, business woman, and an award-winning painter, Charlotta is a woman of many talents! Not only did she paint some of the banners you saw in Vampire Opera, Carnival of Carnage and 20,000 Screams Under the Sea, she is our go-to actress for parts such as the hysterical nurse in the Vampire Opera, a shrieking Mayan in ApoCALYPSO, and the fierce pirate Sadie the Goat in 20,000 Screams Under the Sea, where, along with Captain Nemo and crew, the badass Charlotta defeated the deadly Kraken. is a Jill of all Trades who likes to try her hand at various creative pursuits and then all but abandons them for most of the year. Fortunately, Halloween is the perfect opportunity to put this range of underdeveloped skills to good use, and she’s happy to do Janna’s bidding in whatever projects come up. In addition to working on props, costumes, and yelling things at meetings, Katie oversees Halloween 313’s social media and web presence, and would really like you to use the hashtag #halloween313, please and thank you. Katie made her stage debut as a jellyfish in 20,000 Screams Under the Sea, a Clinton Hell Sanitarium inmate in Nightmare on Clinton Avenue, and the Cheshire Cat in Malice in Underland. had his first Halloween 313 adventure in 2008 as a member of the High School MusiGhoul “posse,” in which five of the members were Dead Sarah Palins. He went to on to play a Dustbowl Clown in Carnival of Carnage, an Evil Tree in A Grimm Scarytale, a Post-Apocolyptic Mutant in ApoCALYPSO, and Nanny Frowsy in Malice in Underland. In addition to portraying weirdos and zombies, Daniel can be found in the prop and costume shops, killing it with papier-mâché, sculpture, design, and creating lifelike corpses. Is there anything he can’t do? In his much less adventurous everyday life he plays the roles of advertising art director, historic preservationist, and animal rescue activist. We could not have done what we did without the support of our community. These organizations were invaluable to our cause, and if you like what we did, please share the love! Society for Clinton Hill – Our partners from the very beginning. Organizers of the Halloween Walk and all around community superheroes!